With all the talk of disruption in the workforce — whether because of technology, legislative changes, multiple generations or the gig economy — the news is often filled with employers complaining about rising costs and a scarcity of top talent. But one group of employers — the Better Way to Build the Economy Alliance (BWA) — is taking a different stance. It’s about making a commitment to decent work because it makes good economic sense, according to Amanda Terfloth, researcher, co-ordinator and producer at the BWA in Toronto. That includes providing an hourly wage of $15, a preference for providing full-time over part-time work, paid sick days and secure scheduling. There has been a degradation of a lot of workplace standards, as jobs being offered are precarious, she said. While many employers continue to believe a high-turnover, low-pay model is the secret to success, partners in the alliance are focusing on providing stable employment, healthy working conditions and high employee satisfaction, according to the report Smart Employers Talk: Building a Better Economy One Job at a Time, covering a September conference in Toronto by the the Ted Rogers School of Management's Centre for Labour Management Relations at Ryerson University, and the BWA. The BWA is a network of employers “that are being a little more vocal about the benefits that they’ve experienced and really that educational aspect, both for the public and also with other employers, in terms of the benefits as an employer by implementing better HR and better decent work standards,” said Terfloth. The result? Higher staff retention, reduced absenteeism, boosted engagement and productivity, greater reliability, higher-quality customer service, lower risks of error, decreased safety risks, better job candidates, and a growing consumer base, according to the report. While each of the participating employers in the BWA may have slightly different models, they all believe in the value of decent work, said Damin Starr, co-owner/operator at Pre-Line Processing Niagara in Ontario, which is also a partner. Back in 2012, Starr began to look at what he was paying people and the repercussions, so he became very vocal in the living wage discussion. Initially, Starr adopted minimum employment standards because it was a simple document to follow, he said. But now his outlook has changed. “I believe that businesses have a responsibility in that aspect, not just to meet minimum standards but to actually participate in guiding those standards, and so it’s about raising expectations,” he said. Pre-Line, which has under 10 employees, has focused on offering employees things such as greater flexibility around working hours, said Starr. There’s also much less of a focus on temporary staffing, as used by Starr’s father when he ran the business. “When I took over this company, the majority of the workforce was temporary and so efficiency, productivity were low in my eyes, in comparison with what I see today in our business,” he said. There was also the issue of safety and potential liability when it came to temporary staff, and the need for proper training each time someone new came onboard, said Starr. With all the changes, Pre-Line has seen its turnover rates reduced from 75 per cent to 10 per cent, alongside fewer workplace errors, and an overall profit margin increase from three per cent to 13 per cent. As for employers that are concerned about making these kinds of changes around decent work, most of their arguments are conjecture, said Starr. One of the first employers to support the BWA was Muskoka Brewery. The 120-employee company in Bracebridge, Ont., first became a Living Wage employer in 2016. 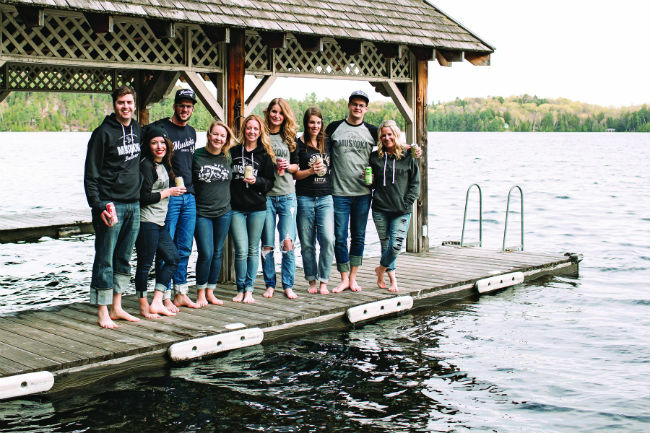 “(We) tried to figure out what our people out on the line needed to make to actually be able to live in the Muskoka area,” said Kelly Watson, director of people and development at Muskoka Brewery. That led to its involvement with the BWA, as the brewery adopted several decent work practices, such as keeping a standard schedule and having full-time employment whenever possible. The company also offers health-care benefits and wellness programs. And that’s led to results such as improved attendance, said Watson. Employees also seem to care more about the quality of their work, and engagement has improved, she said. And while some employers may be concerned about making such a move, it went smoothly for the brewery, according to Watson. For example, in bringing in the living wage, the company did not then give higher rates to every level of employee. Another organization focused on decent work is Access Alliance, a Toronto-based multi-service community organization focused on immigrants and refugees. The group is committed to being evidence-informed and using data to inform its planning and evaluation processes. And a few years back, it became apparent that bad jobs were making people sick, according to Axelle Janczur, executive director. As a result, the 90-employee group made a commitment to pay a minimum of $14 per hour to all employees. Because much of the funding for the organization fluctuates from year to year, many staff are given renewable contracts. But even without the assurance of future funding, Access tries to make contract positions permanent. The organization also grants benefits early to contract employees if it knows their contract will be extended before the 12-month eligibility requirement is met. “It’s a good-faith thing, it’s not in the collective agreement,” said Janczur. Additionally, Access grants 18 personal days per year, and 10 of those can be used for family-related emergencies and responsibilities. All staff must also be given three working days’ notice of schedule changes. As a result, the organization is under the industry benchmark level of absenteeism, and people are committed to their work, she said. And all the changes are not ones that will break the bank, said Janczur. Going forward, the BWA will continue to focus on building awareness around the benefits of decent work, said Terfloth. “Obviously, the recession happened, and we’re actually growing now and rebounding, the economy is changing, but many companies are still operating in that mindset, without looking at how operating in a low-wage, high-churn mindset also constricts economic growth by constricting consumer spending,” she said.